When you’ve been traveling on the highway for hours the journey gets daunting. You see people lose patience with one another and make reckless moves to avoid adding extra minutes in traffic. Witnessing this over and over again, in my head I thought to myself, “I’m just trying to make it home safely.” Yes, it’s hard and my body aches from the hours of sitting. Yes, I want to get through the jumbled mess of cars just as bad as anybody else but if carelessness and not paying attention while driving distract me or anyone else from the task at hand, it may prevent me from getting to where I want to be. Our daily lives and decisions mark the path for us more than we know. If we are rushing about, handling life haphazardly, distractions and reckless behavior may cause major upsets in the flow of the ride, preventing us from our desired destination. Jesus said, “For what shall it profit a man, if he shall gain the whole world, and lose his own soul?” (Mark 8:36). What amount of distractions and desires is worth missing out on heaven for? What reckless lifestyle will cause you to trade off what awaits you up ahead in glory? I don’t know about you, but I’m just trying to make it home safely. There are many things that the enemy will use to take our affection and focus off of our heavenly home. But, my friends, the promise that lies before us is too great to miss out on. Imagine when that day comes to stand before God face to face. Imagine if you will, there we will be sitting at the feast table and sharing in a heavenly celebration with noted characters from God’s holy Word. Can you imagine seeing Jesus for yourself?! Oh, there is something so special about that holy destination that words from the human tongue fail to give it its proper due. But, in my heart and in my mind I long for that place too much to let things down here stand in the way. Do you have a yearning for heaven? Do you desire to bask in the glory of God as His countenance shines down on you? Do you long for peace and joy inexpressible which will fill your being at knowing you have made it over? 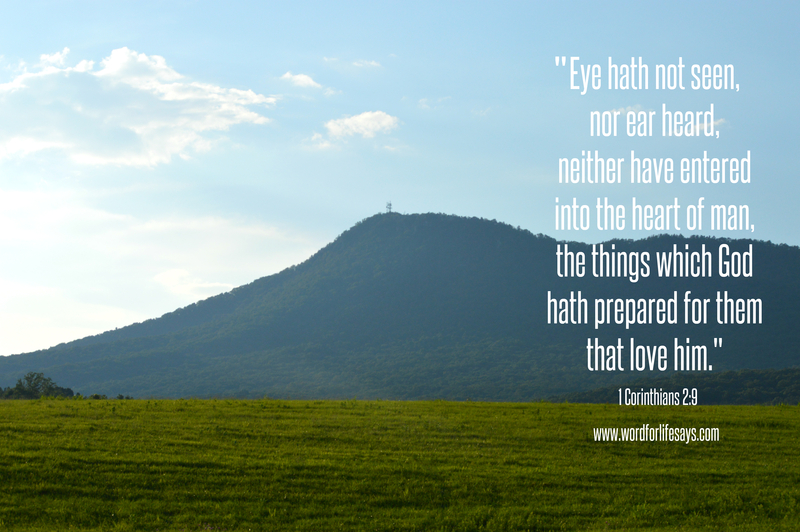 The Holy Scriptures encourages us of that eternal dwelling, stating, “Eye hath not seen, nor ear heard, neither have entered into the heart of man, the things which God hath prepared for them that love him,” (1 Corinthians 2:9).